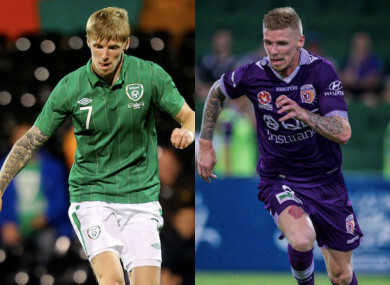 ANDY KEOGH ADMITS it’s been the longest pre-season in history. “14 weeks now so I’m just raring to go,” he says. “I’m feeling really good. It’s the best shape I’ve been in in a long time. And it all starts again in a month. With the exception of a cup defeat to Melbourne Victory at the start of August, his Perth Glory side haven’t played a competitive game since April. They paid the price for a difficult season, culminating in their failure to reach the play-offs. It was tough for everyone. Keogh managed just six goals, the first time he’d fallen short of double-figures since arriving in the A-League in 2014. The team only hit 36 in total and finished third from bottom. They never really got going but a mid-season slump – which saw them lose five games on the bounce – hit them particularly hard. Once everything wrapped, Kenny Lowe was sacked as coach and former Australian international Tony Popovic has taken the reins, an appointment seen as a firm statement of intent. Changes. Drama. Moves. Transitions. New eras. Keogh has seen it all before. His time in Perth hasn’t been without incident. There was a cliched nightclub arrest in February 2015 and then, just two months later, a bizarre salary-cap scandal that involved his wife and uncle and led to him briefly leaving the club and signing with Thai side Ratchaburi. But, through all of that, Keogh has remained a consistent performer. Arguably, he’s played the best football of his career in Oz but he’s reluctant to agree. “I wouldn’t single it out at all,” he says. “I had some great moments in England as well – with Wolves, Millwall – when I first joined them – and Scunthorpe too. But I’ve scored some good goals here and have some good stats to back everything up. In his first season, Keogh finished as the league’s top scorer. In his second, he netted 10 goals in 15 appearances, rejoining midway through after that ill-fated spell in Asia. Fired up upon his return to the city, Keogh broke an A-League record, scored in eight consecutive games and made an integral contribution to the team’s run to the postseason. In 2017, Keogh racked up another dozen goals as the side reached the championship semi-finals. Throughout that time, he’s fielded quite a few calls – from other top A-League sides, from Championship teams looking for a push in their quest for Premier League promotion. But there’s not been any call from home. In the spring of 2016 – after he broke that Australian goal record – he commented on the lack of communication from the Republic of Ireland setup. But the timing wasn’t great for Keogh to get recalled. Martin O’Neill had qualified the Irish side for the European Championships. For the first time in a long time, the mood was positive. Shane Long, Jonathan Walters and Robbie Keane were still relatively dependable in attack. However, that’s not the case anymore. Since Keane’s retirement, the team has lacked punch, verve and consistency in the final third, not that it was ever really very prolific to begin with. Walters is struggling for game-time at Burnley, Long has scored two goals in the last eighteen months, Sean Maguire has only played 12 games since March because of injury. There’s a dearth of options. But what about Keogh? Would it really be so outlandish to call up a striker who is now fourth on the list of all-time Perth Glory top scorers? He admits he’d be shocked if it happened. “You’re off the radar,” he says. But when he made the move to Australia in 2014, did he know it would effectively end his international career? “Listen, I was never a force in the Irish squad, was I?” he asks. Last month, O’Neill openly discussed the lack of options available to him up front. “I can’t deny that it’s a problem,” he said. Not that he spends much time dwelling on it, Keogh still admits it’s been irritating being ignored, especially when he’s kept his head down and been scoring goals regularly. “It is frustrating, actually,” he says. Still, despite his disappointment, he remains a fan. He acknowledges that O’Neill and his management team seem to be under pressure but feels it’s just a cyclical thing and merely part of the process. “There seems to be tension there,” he says. “But they’ve done fantastically well – qualifying for tournaments and getting the passionate support behind them. But every great manager, every good manager, every management team does well and then people want to see change. That’s just football. It doesn’t necessarily mean something good but change is change. People get bored very easily. Trap was flavour of the month for a few years and then he wasn’t. All of a sudden he was ‘useless’ and we played ‘terrible’ football. But is the football any different to what’s being played now? Not at all. So again it’s a roundabout of opinions. People getting bored, wanting change, wanting someone new to talk to at press conferences. Once one part of the media gets bored, they all seem to jump on board. Keogh’s international career blossomed under Giovanni Trapattoni and there are some comparisons between the Italian’s final days in charge and what O’Neill is currently experiencing. Trapattoni guided the Republic to the European Championships in 2012 before the wheels came off. The following qualification campaign was marred by a humiliating defeat in Dublin (Keogh scored his second and final goal for his country in that 6-1 loss to Germany) and the manager struggled to properly convince he could rectify things. But Keogh isn’t so sure. “I think both situations are completely different,” he says. Trapattoni has been in Keogh’s thoughts lately, as have some of his other former managers. Since his mid-2os, he’s been studying for his coaching badges and is now inching ever closer to completing the entire set. “I’ve completed my Uefa ‘A’ licence and just applied for the Uefa Pro Licence with the FAI,” he says. “I’ve been racking up the coaching hours in my spare time – Tuesday nights, Thursday nights, Saturday afternoons. I’m 32 now and you always plan for life after football. I didn’t want to be one of those players that retires and then says, ‘Oh, I think I’ll do my badges’. So I started them when I was 24 or 25 with the plan that when I was 35 – what’s considered the ‘retirement age’ – I’d have every single qualification needed to step onto a pitch at a high level. It doesn’t mean I’ll be any good but it means I’ll have the qualifications necessary to apply for jobs and try and get my foot in the door. Keogh has had quite a few contrasting mentors and it hasn’t been plain-sailing with all of them. Still, particularly as he starts building towards management, he’s grateful for the different personalities he’s got to experience. “I was only thinking about that the other week,” he says. “I was talking to Mick McCarthy because he was giving me a reference for the Pro licence and I had a little trip down memory lane and remembered a few things – the traits and mannerisms he had. At the time I’d be pissed off and annoyed with him about things but I said to myself, ‘You know what, let’s analyse this from a coach’s point of view and from a manager’s perspective’ and it’s really stuff you’re blessed to have come across. Like, just being involved with a person like Mick and others like Trapattoni, and Kenny Jackett at Millwall too. With Popovic in charge, big things are expected of the Glory this season. Keogh is one of the most experienced players in the squad and was handed the captain’s armband last year. “As you get older and more experienced, people look up to that,” he says. Has the increased responsibility changed his on-field/off-field personality at all? Does the captaincy mean curating a different version of himself? “You want people that lead by example and who other players want to follow,” he says. Australia is certainly home now. Keogh and his family are well settled and waiting for their citizenship to come through. There are pangs sometimes. For family and friends both in Ireland and the UK. But, such is the emigrant story. “You can’t have everything in the world,” he says. “You’ve got to miss them but enjoy them when you get to go back and visit. It’s very difficult in terms of logistics but it doesn’t stop us. Email “'It's frustrating, actually. You're off the radar. You're playing in a so-called lesser league, in their eyes'”. Feedback on “'It's frustrating, actually. You're off the radar. You're playing in a so-called lesser league, in their eyes'”.